Yesterday, Colleen and I ran in the Hot Chocolate 5k in downtown Chicago with 30,000 other crazy people in 30 degree weather. Like most 5k races, it was a mixture of pleasure, competition, and self-determination. Even better, it was just like writing a concert review or a blog post. Read on to see how you, and this week’s top posts, helped me finish the race. Sure, there wasn’t a live band anywhere near the course, unless you count the DJ blasting cheesy jock jam techno music at Mile 2. But the lack of live music during the race didn’t stop me from thinking about concerts, or the process of writing a concert review. 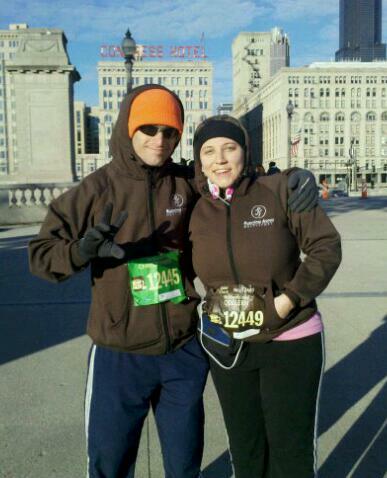 And what also got me thinking about live music was the location of The Hot Chocolate 5K course. It was in and around Grant Park, which is the same location as Lollapalooza. So as I was getting myself pumped before the race and throughout the 3.2 mile sprint, I thought about all my favorite concert experiences I had earlier this summer at Lolla. I’ve shared before how running outside helps me come up with ideas, recharge and make creative decisions for Live Fix. And I actually came up with the idea for this post during the Hot Chocolate race, which is why I want to thank you for helping me get through the race. How Did You Help Me? If you’ve ever run a 5k race before, you know that most of the battle takes place from the neck up: in the mind. When I run a 5k race, like this Hot Chocolate race where I know there’s going to be thousands of other runners, I usually try to find something to loosely focus on so I don’t focus to much on the race itself. And what you’re reading now is the direct result of thoughts I had during the race. That’s Right – Thank You! What you’ll read in the weekly wrap-up — the James Brown Flashback, Red Bull Tour, Writing on Bathroom Walls, Sugarland Livestream Chat and Bon Jovi Fan YouTube Contest — is what I thought about during the race to help forget about my burning muscles, and not listen to the part of my mind that wanted me to stop running. To put it simply, I want to say “thank you” because it was you and our shared love for live music that kept me going when the going got tough. And just like when I can’t find the right words to write a concert review, I pushed on and forced myself to put one foot in front of the other until I crossed the finish line. Many times writing a concert review feels like I’m pushing hard towards the finish line of a 5k. Well, because you have to find the right words quickly, put them all together in order correctly and swiftly, then get the reader to the end fast. And it all has to make sense, entertain and hopefully challenge or educate the reader. And running a 5K is much of the same. You have to start the moment the gun goes off, stay focused on your goal and your own pace, block out the self-doubt, put one foot in front of the other and get to the finish line as fast as you can. And you can ask any music writer or 5k runner that when you finish a review or a race successfully, it can be totally exhilarating. The endorphins and pleasure receptors in our brain explode like fireworks on the Forth of July. And whether the blog post/5k race is easy, or I have to struggle and fight through the process, for me there’s always a pleasure payoff. And that pleasure payoff and the connection between running and writing concert reviews are the two main reasons why I keep running 5K races, writing concert reviews and churning out Live Fix posts. It’s a beautiful cycle of pleasure, pain and inspiration that never lets me down. We’ll have news on Live Remixed trio Keys N Krates, concert previews from our favorite bands, creative interviews with inspired fans, plus more free downloads and cool concert stuff from our sponsors.